A lot of speculators are bearish on precious metals because they believe the Federal Reserve is about to raise interest rates. Since higher rates means a stronger U.S. dollar, many believe this will be bearish for gold and silver. However the Fed won’t be able to hike interest rates without first seeing evidence of a more robust economy with better jobs numbers. Unfortunately Last week’s release of jobs data was much weaker than the consensus forecast. Total nonfarm payroll employment increased by only +142,000 in September, even though economists expected the number to be at least +204,000. Furthermore, the total nonfarm payroll employment for the previous two months of data was revised down. July was changed from +245,000 to +223,000, and the change for August was revised from +173,000 to +136,000. With these revisions, employment gains in July and August combined were 59,000 less than previously reported. Over the past 3 months, job gains have averaged 167,000 per month. If the job numbers in October and November come in at below estimates as well, then there is a good chance the Fed will not raise this year at all. In fact, “the Fed may have to push the hike back until 2017,” says Hank Smith, chief investment officer at Haverford Trust Co., which manages over $8 billion of assets for clients. As a result of slow economic growth, there has been a rally in both gold and silver lately. Silver is currently trading at around $16 an ounce, which is 10% higher than it was last week. It’s pretty much at a three month high and could continue to rise towards the end of the year if labor numbers continue to disappoint. Precious metals and the dollar has a historically strong inverse relationship. As the expectation for the Fed to raise rates this year subsides it’s expected that silver and gold will continue to gain strength. This makes them a great hedge against the U.S. currency. In a low interest rate environment, blue-chip, dividend-paying stocks, real estate stocks and utilities are better risk adjusted investments than fixed income vehicles such as bonds. But having a diversified portfolio is the best defense against an uncertain economy. And having some exposure to gold or silver would protect against a possible decline in the dollar itself. Both metals are still very cheap, relative to where they were in the past. The price of gold seems to be lower now compared to a year ago because the U.S. dollar has become so strong. But when measured in Canadian dollars, Euros, and a number of other currencies gold has actually increased in value during this time. The currency market tends to work in cycles and right now the U.S. dollar is at a high. But if jobs growth in the U.S. continues to miss expectations and interest rates stay low until 2016 then the dollar could slowly lose some of its value. 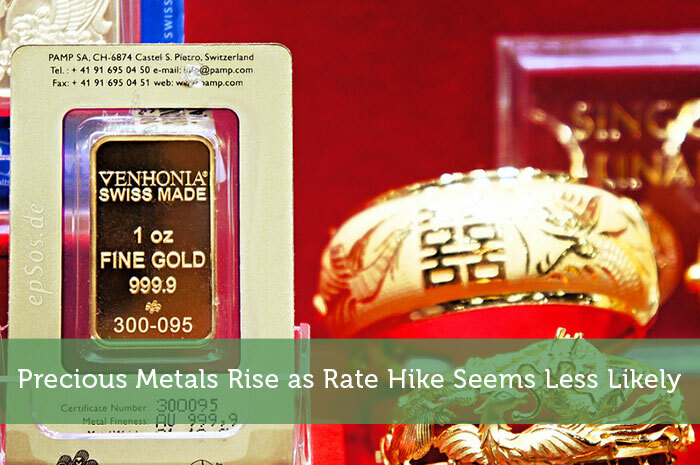 It is very likely then that precious metal prices will move higher.